LG G2 – What it is, and what we think! In a high profile event in NYC, LG have just announced the LG G2, their latest flagship offering. While the ‘thing’ on the rear of the phone is not a fingerprint scanner, it is an intelligent rocker switch which replaces those annoying volume buttons on the side, and offers quite a few purposes! Obviously, this is not all! LG promise to deliver us a phone which gives you ‘real-life benefits’. Personally we love the idea, as almost everything on the market is quoting numbers, but not much about user experience. The learning part is what will probably be the most exciting to consumers, and that is exactly what seems to have inspired the rear rocker key. LG have not only introduced the rocker switch on the back, but also moved the power button to the back of the phone. The idea is simple. It is hard to access the side buttons on our ever thinning phones these days, specially during a phone call. The switch has been placed such that it can easily be accessed during normal use or during a phone call. We imagine there will be other functions too, which will probably come from different apps. The double tap on the screen to wake up the screen is a welcome addition too, which means you don’t have to press the power button to wake the device up. In fact, having it on the back means it is inaccessible anyway. This feature is a bit similar to Blackberries and Nokia, and for this phone, it is called KnockOn. Phones are getting bigger, and this one is no exception. It features a 5.2″ display, with a 2.7″ wide phone body, making this the largest screen in that size. This means that we have a reduced bezel (2.65mm) on the sides, and an IPS technology display, giving you Full HD resolution @ 423 ppi. What matters the most about a phone these days? Let’s rephrase that one! What bothers you the most about smartphones these days? If you all shouted ‘Battery Life’ in unison, then welcome to the club of everyone. This packs in a 3000mAh battery, with a special Graphics processor, increasing the phone’s efficiency even more. However, they call it ‘ready for a full day’s work‘. Not sure if that is a good thing or a bad thing! Surely, we want at least 2 days out of it! A 13 MP camera is pretty standard on most high end phones these days, but this one packs in OIS, and promises to give you a full resolution while employing it as well. Other features such as Super Resolution and Multipoint-AF are also mentioned. Another feature where phones are starting to compete is the speaker quality. 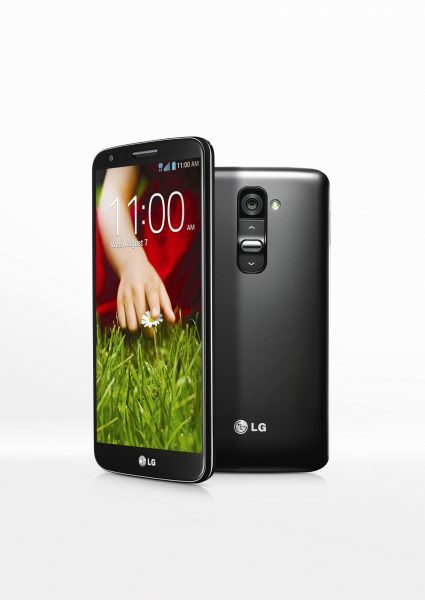 The LG G2 offers a 24bit/192KHz Hi-Fi playback, offering better quality than CD. This is something we’re particularly keen to check! Will it beat BoomSound on the HTC ONE? Answer Me – Automatically answers the call when phone is raised to ear, after lowering ringtone. Plug & Pop – offers options when USB or earphones are connected. QuickRemote – It can work as a remote for your devices, and more importantly, it can ‘LEARN’ from conventional remotes, and allow users to adjust the layout. Slide Aside – Enables multitasking by sliding apps using three finger swipe. Guest Mode – Protects privacy. Among the above, we think that Quick Remote is the most exciting addition, specially the ability to learn from remotes, and the adjust layouts. This is something that is an issue on the Galaxy S4, and while HTC ONE does it better, it still doesn’t learn. Slide Aside is a good idea too, though once again it needs to be played with. Answer Me, and Plug & Pop already exist on the Galaxy S4. Guest Mode is something that is already becoming a part of Android 4.3. Well, of course it does! It promises to roll out globally to over 130 carriers in the next 8 weeks. The roll out will be South Korea, followed by North America, Europe, and other markets. No dates or prices are available yet. 2.26GHz Quad Core Qualcomm SnapDragon 800 Processor. Almost sounds like a tongue twister. Also packs in 2GB of RAM, and gives you a memory size of 32GB/16GB. 4.2.2, but I am sure 4.3 would follow soon. Will this beat the S4 or the HTC ONE? It definitely has the ability to, but it all depends on how well LG market it, and how they price it, and how accessible it is world over. While some of the features are clearly inspired by others, some innovation is evident, and that is quite rare in a highly saturated market these days. Definitely an exciting phone, and we’d be watching it’s progress quite keenly! Previous story LG G2 to be announced today!